189 in stock Need More ? Reprint. Originally published: as My very first Oxford dictionary. 1999. A fully illustrated alphabetical first dictionary for 4-5 year-olds. 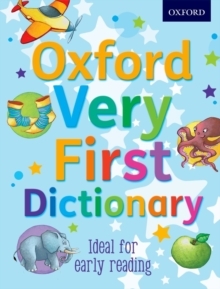 A fresh new look for the Oxford Very First Dictionary which introduces children aged 4+ to the features of a dictionary in an appealing way. The dictionary has over 300 familiar words, each with a simple definition and an illustration which reinforces the definition. Each page is clearly laid out so it is easy to pick out the main features - the alphabet down the side of the page, the letter of the page you are on in red. A lovely extra for this age level is the illustrated openingletter - A shows a juicy apple, B shows some buzzing bees. There is also a fully illustrated section at the end with vocabulary on topics related to first learning, e.g. colours, numbers, shapes, days and months, as well as a list of common words and a simple introduction to grammar with a list of verbs or'doing words'. This is a great introduction to the world of dictionaries. For downloadable fun word games, puzzles, and activities, go online to the www.oxforddictionaries.com/schools website.